Arianespace officials have approved the rollout and launch of the final Ariane 5 flight of the year, set to blast off Wednesday from French Guiana to haul Brazilian and Japanese communications satellites toward their orbital perches more than 22,000 miles above the equator. The Ariane 5 rocket, made up of two power solid-fueled boosters and a two-stage hydrogen-fueled core, will roll out of the Guiana Space Center’s final assembly building Tuesday morning for the hour-long trip to the ELA-3 launch pad, where technicians will prepare the launcher for Wednesday’s final countdown. The 1.7-mile (2.7-kilometer) journey to the pad will be powered by a diesel-fueled Titan tug to set up for the seventh Ariane 5 launch of 2016, tying the mark for the most Ariane 5 missions in a year previously set in 2008 and 2012. 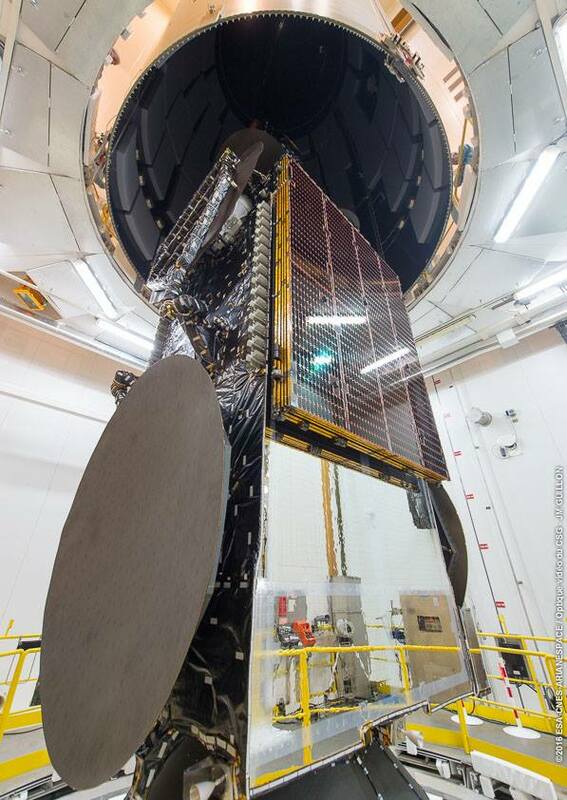 The Star One D1 and JCSAT 15 communications satellites are encapsulated inside the Ariane 5’s nose cone for launch Wednesday at 2030 GMT (3:30 p.m. EST; 5:30 p.m. French Guiana time), the opening of a 75-minute launch window. Both payloads on the tandem launch were manufactured by Space Systems/Loral in Palo Alto, California, and are designed for 15-year missions. JCSAT 15 will broadcast pay television channels for SKY Perfect JSAT’s SKY PerfecTV! service over Japan, and enable data transfer and maritime and aviation connectivity. 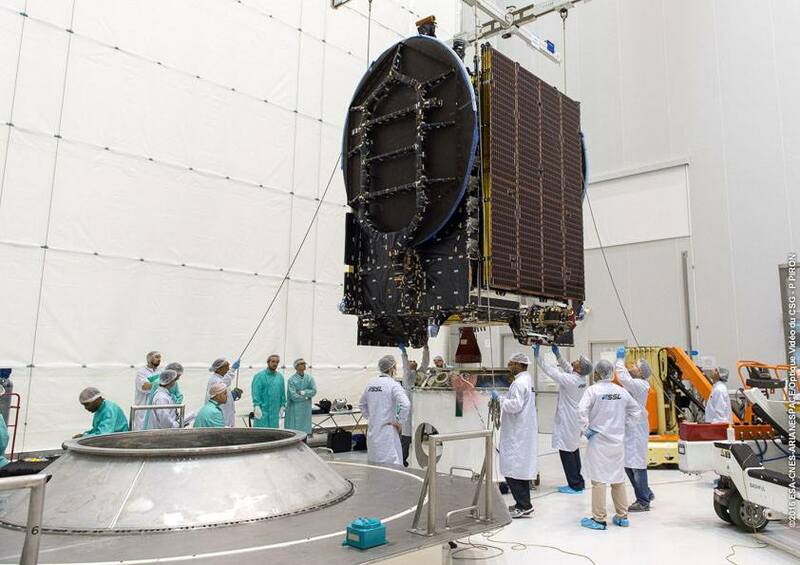 Ground crews at the Guiana Space Center, a European-run spaceport on the northeastern coast of South America, completed assembly of the 180-foot-tall (55-meter) Ariane 5 rocket last week with the enclosure of the 14,182-pound (6,433-kilogram) Star One D1 spacecraft, which will ride in the upper position on the launch, inside the Swiss-made payload fairing. 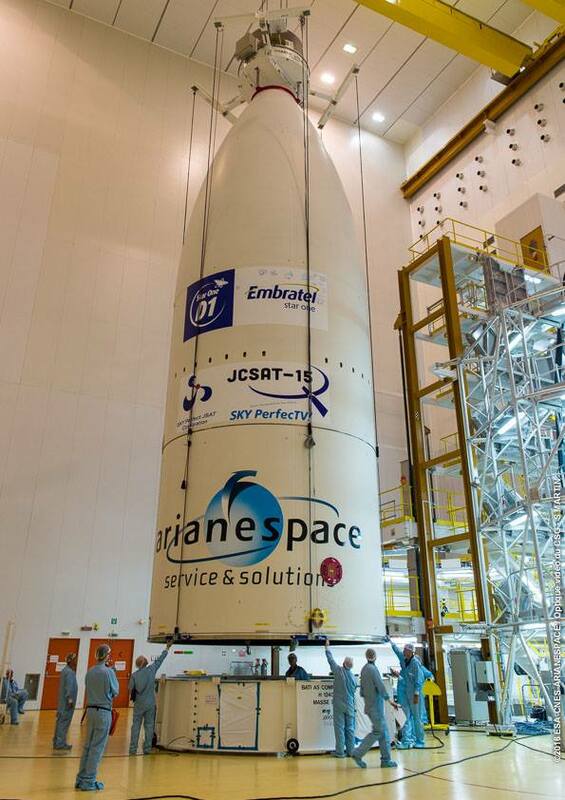 The Japanese JCSAT 15 spacecraft, weighing in at around 7,500 pounds (3.4 metric tons) at launch, was attached on top of the Ariane 5’s second stage inside the final assembly building. Once technicians connected JCSAT 15 to the launcher, a crane lowered the Star One D1 satellite, already inside the fairing, atop the rocket. Stacking of the Ariane 5 rocket began Nov. 2 inside the launcher integration building with the hoisting of the first stage vertical on the mobile launch table. The two solid rocket boosters were added to each side of the core stage Nov. 3 and 4. The upper stage was added Nov. 8. The rocket was transferred to the nearby final assembly building Nov. 30 to receive the Star One D1 and JCSAT 15 payloads. The Ariane 5 launch team held a launch rehearsal Saturday, and a launch readiness review Monday approved plans to roll out the powerful rocket to the launch pad. Wednesday’s flight will be the 90th launch of an Ariane 5 rocket, and the 234th flight of the Ariane rocket family since the first Ariane 1 mission took off Dec. 24, 1979. This week’s mission is known as VA234 in the Arianespace flight sequence, and the vehicle is known as Ariane 5 launcher No. 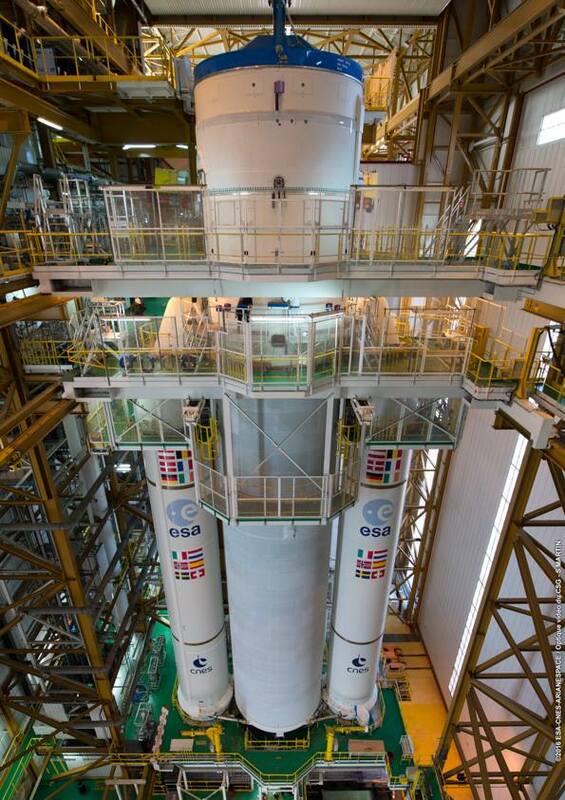 587, the serial number assigned inside the rocket’s Airbus Safran Launchers factories in France and Germany. Final countdown operations will begin Wednesday around 0847 GMT (3:37 a.m. EST), kicking off final checks of the Ariane 5’s electrical, telemetry and navigation systems. Liquid hydrogen and liquid oxygen propellants will be pumped into the first and second stage tanks, and the computer-controlled countdown sequencer will begin around seven minutes prior to liftoff. The Ariane 5 core stage’s Vulcain 2 engine will fire up when the countdown clock strikes zero, then two side-mounted boosters will ignite with a torrent of exhaust to propel the launcher into the evening sky on top of 2.9 million pounds of thrust. The boosters will drop away less than two-and-a-half minutes later, then the Ariane 5 will shed its nose fairing as it soars east from French Guiana over the Atlantic Ocean. 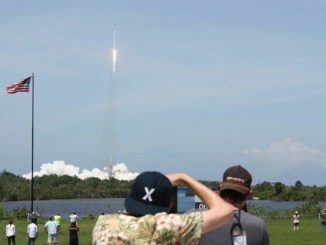 The first stage will shut down around nine minutes into the flight, and the second stage’s HM7B engine will start up to send the Star One D1 and JCSAT 15 satellites into an arcing elliptical transfer orbit ranging between 155 miles (250 kilometers) and 22,310 miles (35,905 kilometers) in altitude. The target orbit should be tilted at an angle of just 6 degrees to the equator, a benefit of the equatorial launch base in Kourou, French Guiana, positioned at about 5 degrees north latitude. That will reduce the work each spacecraft needs to do to climb into their operational posts neary 22,300 miles (35,800 kilometers) directly over the equator. 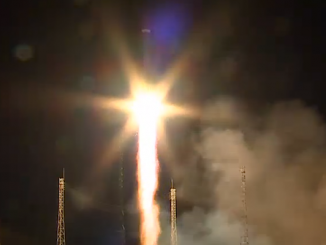 The top-mounted Star One D1 satellite will deploy from the Ariane 5 first around 29 minutes into the flight. 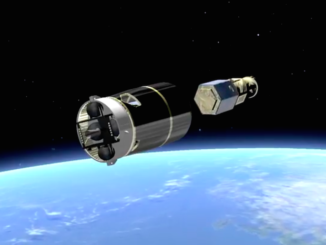 The Ariane 5’s Sylda dual-payload adapter, a structure designed to accommodate the launch of two large telecom satellites on the same rocket, will jettison a few minutes later, followed by separation of the JCSAT 15 spacecraft around the mission’s 43-minute point.